1950s-’60s Era Sterling Silver Mid Century Modern Cuff Links & Tie Tack Set -- Free US Shipping! 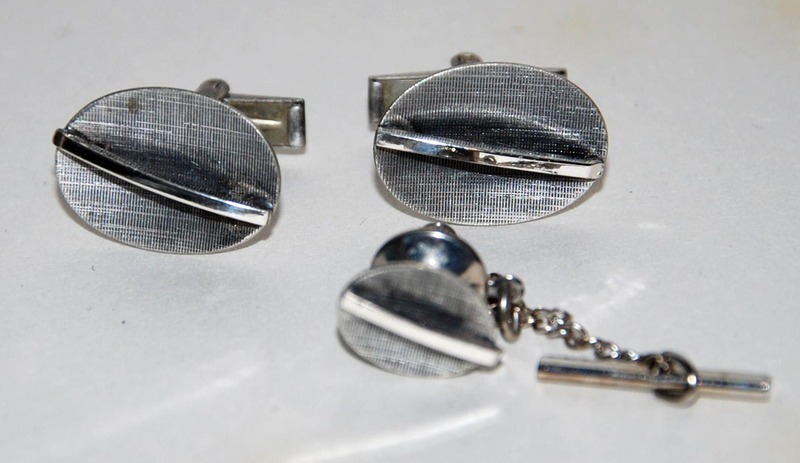 This is a pair of Mid-Century Modern sterling silver cufflinks and a matching tie tack. All in very good condition with no restoration or repairs, but with minor cosmetic surface marks consistent with age and normal use. We have not polished these so some mild tarnish exists, which is easily removed. Country of manufacture is most likely USA; there is a maker's maker which is unknown to us. Size and maker's mark are shown on the pix. 1970s era Sterling Silver 875 Russian Ukrainian Cuff Links-- Free US Shipping! 1920s-'30s Era Sterling Silver and Guilloché Enamel Cuff Links -- Free US Shipping! 1950s-'60s era Silver Tone Cuff Links and Tie Bar Set Perfect for Skinny Ties -- Free USA Shipping! 1950s Era Krementz Love Knot Cufflinks -- Free US Shipping!